Vancouver has a new cinematic art installation this summer! 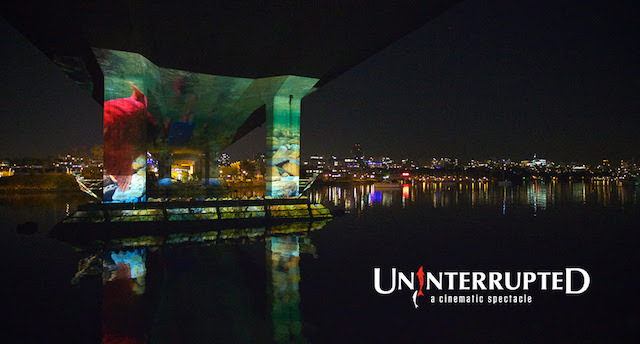 Projected onto the underside of the Cambie Bridge, the river meets the city with Uninterrupted, a story about wild Pacific salmon migration that unfolds nightly along with an ambient, original soundtrack. Wild salmon are a major building block within the Pacific ecosystem – if you live in BC or the Yukon that’s your neighbourhood. These amazing fish are intimately connected to our lives and our western landscape in ways we rarely consider. Uninterrupted brings the beautiful struggle of a salmon migration to the heart of the city, encouraging everyone to think about the connections between people, animals, and the environment – and to take action in our own communities. Free viewing takes place in Coopers’ Park, on the north side of the bridge, with nightly capacity for up to 800 people. We ask that you arrive at least 15 minutes in advance; there are also pre-event projections to enjoy. Follow Uninterrupted on Twitter, Facebook, and Instagram for more info.